Visit Guatay Mountain Nursery to find California native plants including many native to San Diego county. 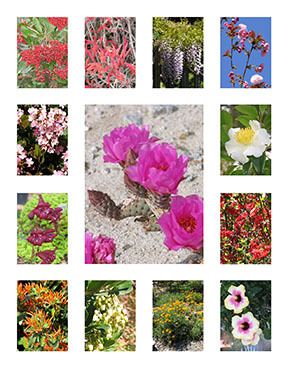 I search out native and drought tolerant plants for Southern California gardeners. I look for cold hardy and drought tolerant natives that can withstand our local strong Santa Ana winds and arid conditions. If I don't carry a plant that you want to try, I will try to find it. Many local native species are planted in my back-country nursery borders and I have them for sale, too. A lovely spot I designed. I also offer design services. One of my designs that is compatible for dry landscapes. 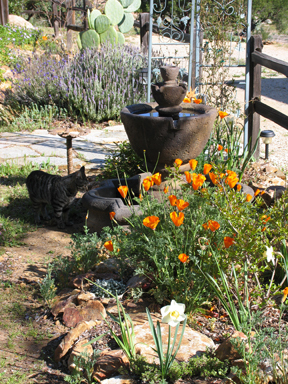 I make plant recommendations and placement suggestions to homeowners in the mountain areas of San Diego county. You tell me the look you are trying to create and I will set up a selection at the nursery for you to preview. Ask me about the best native or xeric (drought tolerant) plants for your area. I look for cold hardy natives that can withstand our local conditions.